Do not hesitate a second! 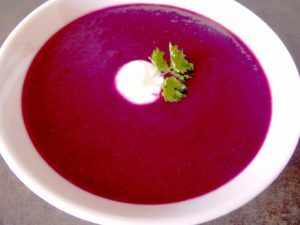 This amazing recipe for a blackcurrant gazpacho (never thought of it, did you?) will delight you and your guests! 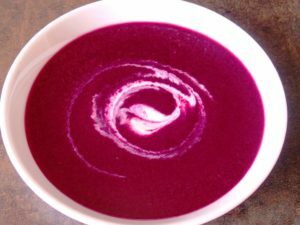 It is simple to make, absolutely not expensive, but loaded with anthocyanins and vitamins. Probably the trendiest and healthiest recipe on this website! Wash and dry the blackcurrants, cook them for 10 minutes on low heat. Cut the beetroot into cubes. Peel the tomatoes and remove the seeds. Cut the tomatoes. Put the bread for steeping with the vinegar and little water. Cut the onions and garlic clove. Fry them for 3 minutes on low temperature in olive oil. Put them in a blender with the beetroots, tomatoes, blackcurrants and bread. Add salt and pepper according to your taste. Mix and strain. Mix again, including 200ml of iced water little by little. Serve in glasses topped with a few cubes of toasted bread rubbed with garlic. I have added a teaspoon of yogurt and parsley for decoration.